Enjoy a delicious Island Buffet including savory Hawaiian, Asian and American cuisine when you book the General Admission & Show! Limited availability. Please book in advance. Visit one of Hawaii's biggest cultural attractions! Oahu's Polynesian Cultural Center celebrates traditional Polynesian culture and gives visitors a unique opportunity to immerse themselves in the seven Polynesian villages. Visit Tonga, Tahiti, the Marquesas, Fiji, New Zealand (Aotearoa), Samoa, and Hawaii as you embark on a journey through the island nations of Polynesia. See islanders reenact war dances and wedding ceremonies, carve tiki figures, or climb barefoot for coconuts. These packages include general admission and tickets to PCC's "Breath of Life" evening show. The center opens at 12 p.m., allowing you the entire afternoon to explore the six different villages before dinner. A great way to learn the history and culture of Polynesia, take a trip to PCC for a fantastic and educational day! For premium dinner plans at the Polynesian Cultural Center, please check out our Alii Luau and Prime Dinner packages with Full Day and Dinner & Show Only options. HA: Breath of Life-Tahitian dancing! General Admission to enjoy six hours of cultural activities from 12 noon and an Upper Level Reserved Seating ticket to the "HA: Breath of Life" night show, as well as a free buffet dinner! PCC features six Polynesian villages, each dedicated to a different nation: Hawaii, Tonga, Samoa, Fiji, Tahiti, and Aotearoa. Throughout the day, you can watch cultural demonstrations at each island village. PCC's famous show blends a mix of Polynesian cultural performances with a theatrical flair to create a stunning evening show. From Waikiki (35mi, 65-75min): Head WEST on the H1 Freeway. Take exit 20A to merge onto the HI-63N (Likelike Hwy). Follow the Likelike Hwy towards Kaneohe and take a left onto the Kahekili Hwy (HI-83) north and continue onto the Kamehameha Highway (after Kaneohe) towards Laie. Follow the Kamehameha Hwy up the coast and the Polynesian Cultural Center will be on your left just after Laie Beach Park. Parking Information: Parking is available for a small fee of $10.00 per car. Prices are subject to change without notice. Enjoy dances from all over Polynesia! General Admission to enjoy six hours of cultural activities from 12 noon. Tickets to the "HA: Breath of Life" night show is not included. HA: Breath of Life, an awe-inspiring show! Upper Level Reserved Seating ticket to the "HA: Breath of Life" night show. General Admission to enter the center before 6pm is not included. From Waikiki (35mi, 65-75min): Head WEST on the H1 Freeway. Take exit 20A to merge onto the HI-63N (Likelike Hwy). Follow the Likelike Hwy towards Kaneohe and take a left onto the Kahekili Hwy (HI-83) north and continue onto the Kamehameha Highway (after Kaneohe) towards Laie. Follow the Kamehameha Hwy up the coast and the Polynesian Cultulral Center will be on your left just after Laie Beach Park. No alcoholic beverages are served at the Polynesian Cultural Center. Wheelchair Accessibility: With the exception of the canoe ride, all facilities at the Polynesian Cultural Center are accessible by wheelchair. A transfer vehicle equipped with a lift is available with prior notice of at least 3-4 days. Please indicate during booking to secure arrangements. Wheelchairs must be no larger than 48" x 28.5" and must not exceed a total combined weight of 600 lbs. Minibuses can accommodate two rigid-framed wheelchairs. Guests with 3-wheeled scooters must occupy a seat. How long will it take to visit all of the park attractions? 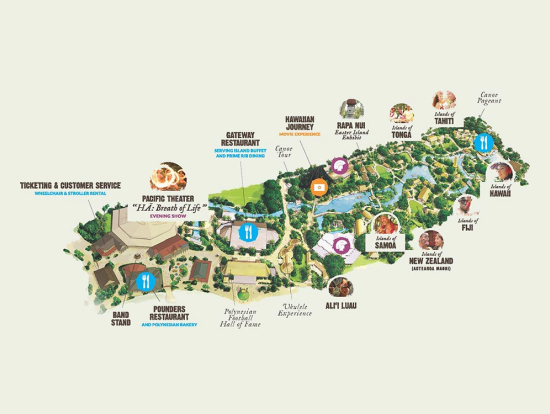 To experience everything that the Polynesian Cultural Center has to offer, it will take approximately 4-5 hours. Click here for a map of daily attractions available at PCC. Can I purchase an upgrade once I get to the park? Yes, but the ability to purchase an upgrade is based upon availability. Is re-entry to the park on the same day allowed? Yes, admission is good for the entire day and includes in and out privileges. What is the "Ha: Breath of Life" seating chart? I had an awesome experience! Why would need 50 characters?